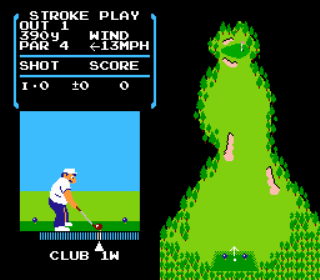 Golf was one of four completely forgettable sports titles released with the launch of the NES. The game can either be played single player, or 2-player in stroke or match play format. The game features only one course, but it is a full 18 holes and the holes are varied enough to keep the game interesting. Unfortunately, the aiming system in the game is terrible. Instead of being able to move your target continuously, you can only move it in ~15 degree segments, making it very hard to accurately place your ball. Because of this, you have to intentionally either hook or slice your ball to get it right where you need it. The game also does not display yardage ranges for your clubs, and even worse does not display the distance remaining to the hole, making club selection a real guessing game. It’s a shame, because with a few tweaks this could have been a half decent golf game, and a stellar launch title for the NES. Golf does have one claim to fame, however. It is the first video golf game to use the three click swing system. Even that isn’t done well though, as the marker moves too fast. When trying to chip onto the green from a short distance, you basically have to tap A three times in a row as fast as you can, which really cuts down on accuracy. Ultimately, this game is best avoided. Tagged Golf, launch, NES, Nintendo, Review, Sports. Bookmark the permalink.